Comfortable knit costume vest with traditional horn buttons. A true combination of talent, this simple knit costume vest made of soft wool mix in dense knitting stitches provides warmth on cooler days and represents an ideal addition to all the Oktoberfest outfits. The natural appearance is skilfully enhanced with the scoop neck, two convenient pockets, the straight shoulder fit and the long button placket with loose dark brown knitted. Another eye-catching feature, the classic horn buttons go up as far as the neck. 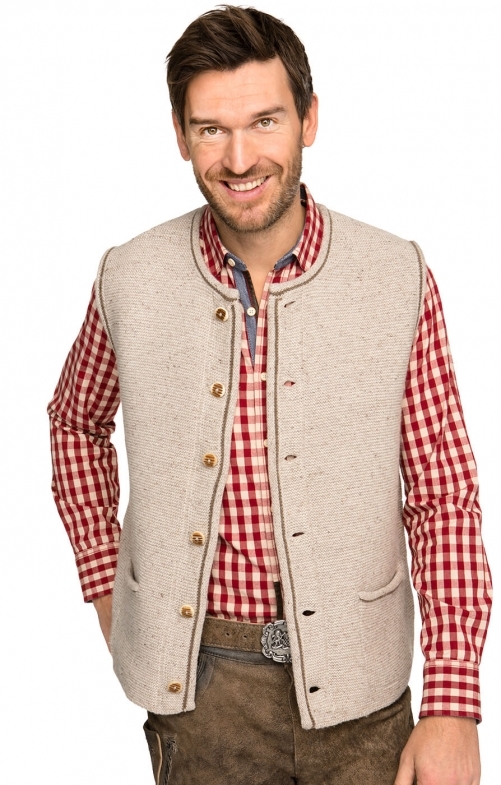 With its neutral colour and simple design, the vest can be combined seamlessly with any kind of men’s country fashion item. Die Weste ist angenehm zu tragen. Have now purchased two of these knitted waistcoats for my husband, in different colours. Well made, good fitting, and of smart appearance.